I’m kind of embarrassed to post today’s recipe, but I was craving Rice Krispie treats and made two batches. 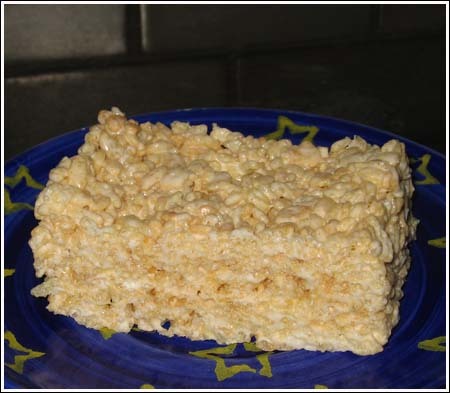 For the first batch, I followed the classic recipe from the side of the Rice Krispies box. The only change I made was to pour the batter in an 8 inch square pan so that the treats would be tall and stately. The second batch was made out of sheer curiosity. A few weeks ago, a reader asked me if I had a recipe for Rice Krispie treats made with canned frosting. I didn’t have it at that point, but I tracked it down and up until today, have been wondering how those would taste. Now that I’ve tried both versions, I think I prefer the classic. However, somewhere out there, someone else is probably looking for the frosting version so here it is. These don’t hold together quite as well as the classics, so I recommend cutting them small. Grease a 13×9 inch pan or line with foil and spray foil with cooking spray. In large bowl, stir together corn syrup, melted butter and frosting until well blended. Stir in cereal until coated thoroughly. Dump mixture into prepared pan and press to fit. Chill for 1/2 hour or until firm. Grasp foil or parchment and lift from pan. Place on a cutting board and cut into about 24 squares. When you say “plain syrup” are you referring to pancake syrup or maple syrup? Any other syrup other than corn syrup would probably add a wonky flavor. I wouldn’t advise changing syrups. yum can you use just plain syrup too?! Thanks for the idea of adding coconut. Marshmallow treats never go out of style, that’s for sure. The Coffee Recipe sounds very good. I make Marshmallow treats quite often since it is so easy and my grandkids just love them. I will vary with my additions to coconut, which makes them more chewy, to peanut butter (chunky) to my favorite —-butter brickle bits—–oh so good. I always add about 1/4 cup of chunky peanut butter when I make rice krispies treats. The frosting recipes sounds great but rich! You’ve inspired me…I’m making rice krispies along with a chocolate chip pound cake to take to a meeting I have on Friday. Have you tried using the new strawberry jet-puffed marshmallows? They make a great combination with the choco/vanilla rice krispies or the berry rice krispies! Gigi, I suppose the frosting version is vegan. That is, if you make sure to use a vegan butter sub and a frosting without dairy. I used the Pillsbury Classic White and didn’t notice any dairy or gelatin on the label. I made Rice Krispy treats a few years ago with a non-marshmallow based recipe (I’m a vegetarian and virtually all mass market marshmallows contain gelatin) and they came out quite good. Of course, now I’m craving them and can’t find the recipe. AARRGGHH!!! It definitely didn’t have canned frosting in it…never would have considered using that as a substitute for marshmallows. Maybe the recipe I used had Fluff (which doesn’t contain gelatin). I think a Google search is in my future.